Thanos Andronikos, graduate in Arts Management and owner/manager of Heartbeat Gallery, Sheffield, describes the construction and development of the small ornamental shrines designed to hold a single icon. 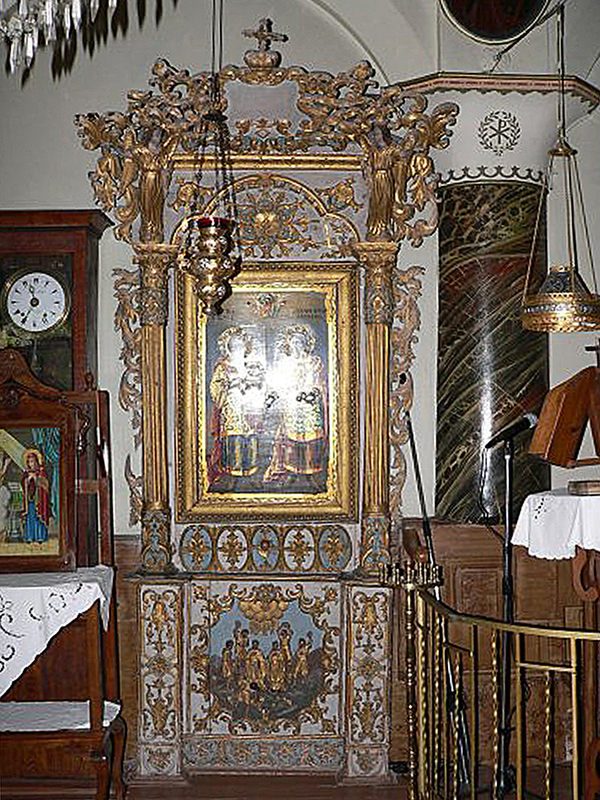 In the Eastern Orthodox Church, shrines (or proskynetari – προσκυνητάρι – from the verb proskyno, meaning ‘to kneel in worship’), are small free-standing or wall-mounted constructions, in which icons are placed to be worshipped by the faithful. It is not known exactly when the first shrines appeared, but they are undoubtedly related to the evolution of the iconostasis, the large and solid screen of icons which is such an important liturgical feature of the Orthodox church. 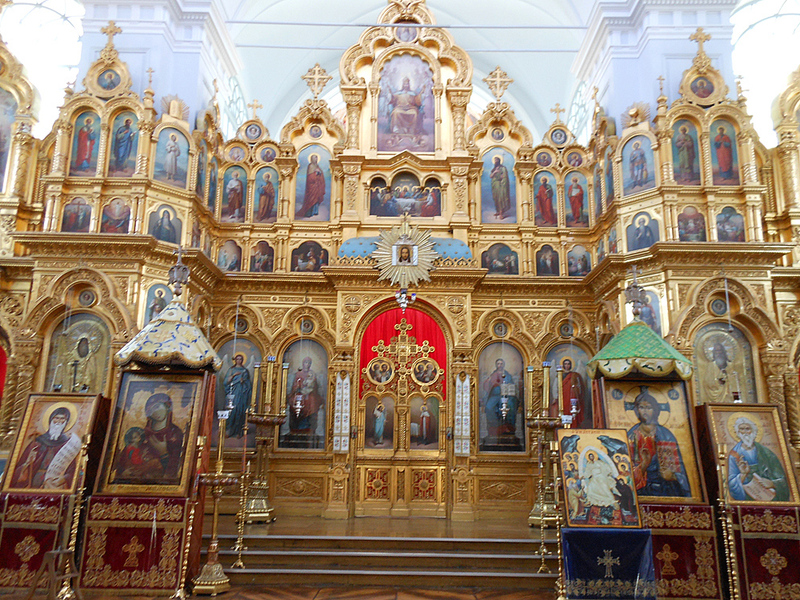 In some cases the shrine or shrines may extend the span of an iconostasis to the north and south wall of the church, or they may sometimes be used to connect the three parts of the iconostasis, when these are separated by small columns. The Basilica of the Nativity in Bethlehem is one important example of a church containing a large group of shrines, seen above in a side chapel beside the magnificent main iconostasis, carved in 1764 . Shrines are generally commissioned from the carvers by private donors, or – as in the example above – by a particular body or group; in this case the ‘Guild of Soap-Makers’. They are placed at various points inside the church – either along the walls, or free-standing where there is space. They are usually morphologically related to the iconostasis of the host church: they may be dedicated to the patron saint of that church, or to the holy event the church is named after, with particularly popular subjects being the Virgin Mary (Theotokos-Panagia) or scenes from the Life of Christ; they may also be linked to the donor’s name saint or to the saint in charge of some specific area of influence. They could be described as free-standing altarpieces, usually with an icon set upright in an elaborate frame, and sometimes (or instead) with an icon set immediately beneath in a canted position, which is intended to be kissed and venerated by the worshipper. The base of the structure, below the level of the icons, echoes the lowest level of the iconostasis, and contains a panel (the thorakion) which may be carved or painted with decorative motifs, with a religious scene, or with a symbolic or emblematic device. The thorakion was originally a block of stone used in the parapet of a classical temple to create a low protective wall, and similarly describes the stone, and later wooden, panels in the lowest tier of an iconostasis. 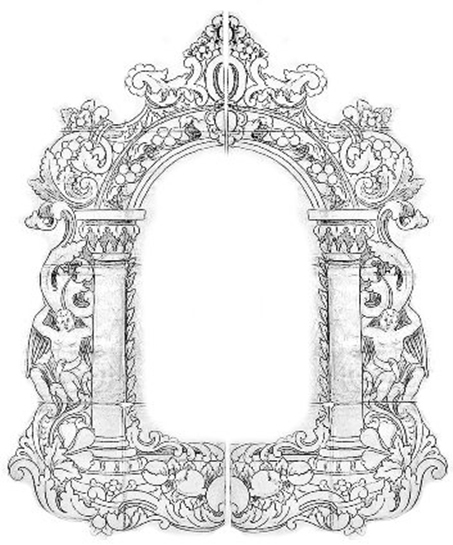 The thorakion was also often ‘framed’, as above, in a decorative border of foliate and floral ornament. Its use on the base of a shrine meant that the structure as a whole reflected a single bay from an iconostasis, from the level of the entablature to the ground, as though the grand liturgical sweep of the icon screen had been synthesized into an intimate private chapel, for the use of a single worshipper. Carved giltwood & polychrome wall shrine with icon of the Holy Trinity, 1741, Iera Moni Taxiarhi, Nenita, Chios (note the Eucharistic grapevine at the side). The earliest examples of these small shrines date from the 18th century, when they are most often carved in wood, and are frequently very elaborate, as in the example above. As with the making of an iconostasis, the timber used to build a shrine is resinous: it was produced from straight cypress logs which were cut in January on the days of the waning moon. The first stages in processing the wood were quite basic: removing the bark with an adz, drying the logs indoors, followed by sawing them into rough planks. The wood was then impregnated with olive oil or linseed oil and planed . 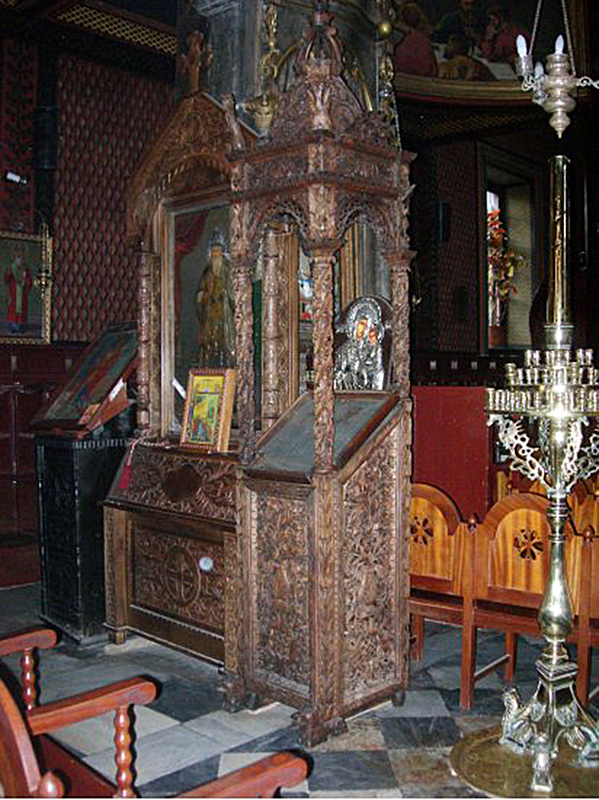 The design for the frame and other decorative parts of the shrine were transferred to the wood in exactly the same way that images had been transferred to panels for the artist to paint, ever since the earliest Byzantine icons. The patterns used are known as the woodcarver’s ‘anthivola’ (Ανθίβολα), which by the 19th century had come to be known as στάμπες, or – literally – ‘stamps’ . They are the same size as the piece of wood to be carved, and the lines of the design are perforated with pins, creating small holes, millimetres apart. The patterns derive from the anthivola used by Byzantine artists and craftsmen, which diffused through Greece via Crete and those Greek islands under the control of Venice. The carver laid the perforated pattern on the planed surface of the wood. He would then enclose finely powdered coal or charcoal in a piece of loosely-woven cotton cheesecloth, called ‘touloupani’ (τουλουπάνι), and rub this cloth bag over his anthivolo. The coal dust was forced through the pinholes, and the design was imprinted on the wood. 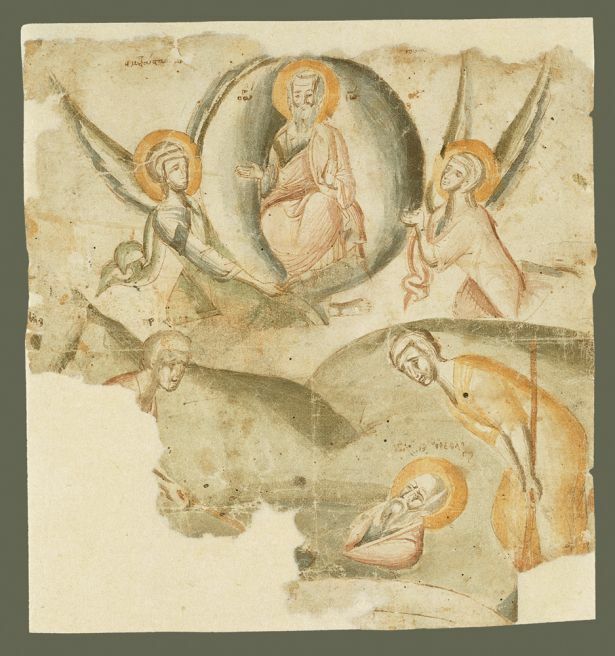 The growing demand for icons, iconostases, shrines and thrones, and later on the dissemination of paper as a design material, gradually spread the use of the anthivola throughout Greece in almost all important centres of post-Byzantine art. 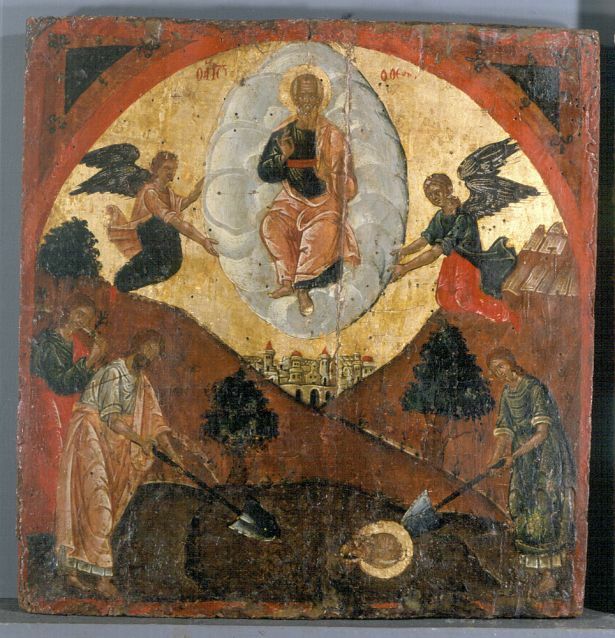 The 15th-16th century Dormition and Assumption of Hagios Inoannis o Theologos is one of the earliest works in the Byzantine and Christian Museum’s collection of anthivola; it shows the type of pattern used for a painting, rather than a piece of decorative carving. It was probably produced by a Cretan painter, and may have been intended for purposes of demonstration or teaching. The reverse has been covered with later written notes and sketches. Anthivola were valuable assets, passed from artist to artist in commercial transactions, by exchange or through inheritance, creating a corresponding traffic in iconographic conventions and woodcarving practices between one artistic workshop and another. This partly explains the reason Byzantine icons and murals are so similar; this was the intention, to reproduce as exactly as possible a venerated image. In the same way, the ornamental motifs used to frame iconostases and shrines reproduce the same designs from region to region, and era to era. The popularity of naturalistic decoration in all styles – Baroque, NeoClassical and revival Byzantine is clear; extravagant foliage, often filled with birds and animals, appears ubiquitously. Vines are a particular favourite, as they are both decorative and symbolic. The same craftsmen who made the shrines were also responsible for iconostases, thrones for the Patriarchs, pulpits, crosses, chairs and statues. In the peak years of production – especially in Crete – there were workshops organized under a master carver (‘protomastoras‘), with a group of assistants, each in charge of a particular area of the process, depending on their experience. The guild system oversaw the hierarchy of the workshop, just as in Western Europe. 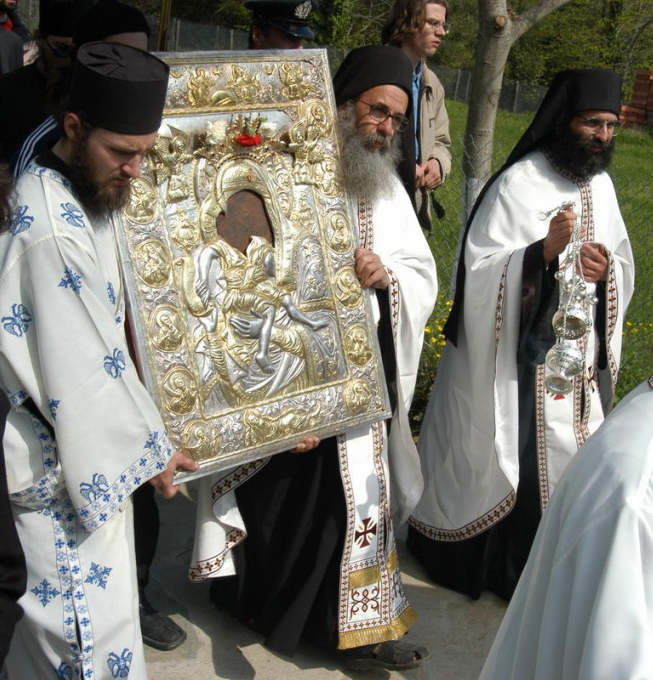 Because many shrines are not mounted in fixed positions on the wall, but are free-standing and small enough to be portable, the icons they hold may also be used in open air litanies or processions (Λιτανεία), being carried on the shoulders of worshippers. This usually forms part of the ceremony carried out on the name day of the patron saint . In the litany of Ieros Naos Protatou on Mount Athos, above, the icon being carried is that of the “Άξιον έστιν“ or Axion Estin. This is translated as ‘It is truly meet’, and is another title of the Theotokos (or Mother of God) holding Christ. 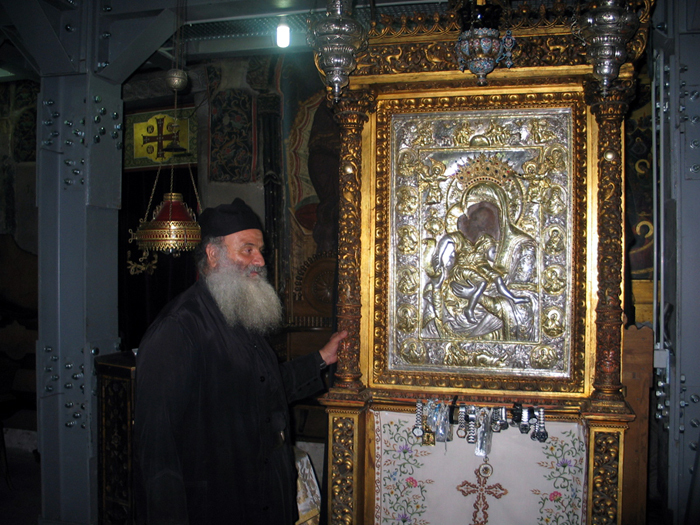 It is one of the holiest icons of Orthodoxy, and is kept in the church of Protaton in Karyes, Mount Athos. 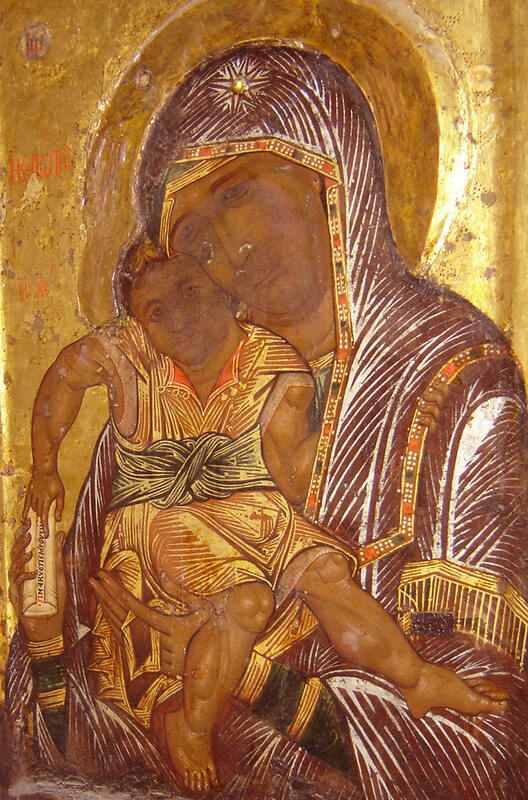 The original icon is made from tempera or encaustic wax on wood, like most portable Byzantine icons; it dates from the tenth century, and was painted in Constantinople, copying a portrait of the Madonna and Child supposed to have been painted by St Luke himself. This is a direct expression of the ‘vera icon’ or true image which could be passed down by reproducing exactly the original painted portrait. The story of St Veronica, and the image of Christ which was transferred to her veil after she wiped His face, is an allegory of this exact recreation of a holy icon. 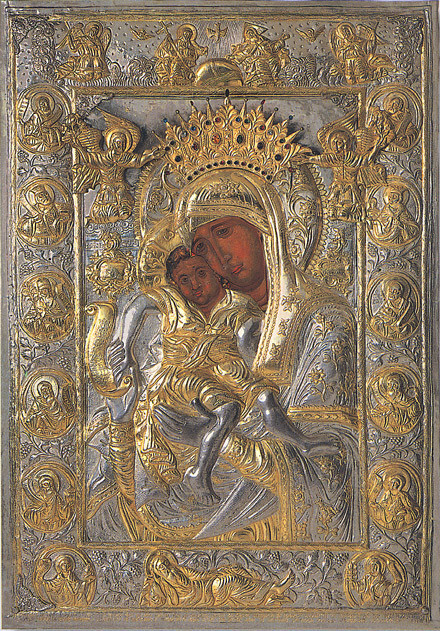 The silver and gold cover of the icon (the επένδυση – ‘ependesi’ or what, on a Russian icon, would be the ‘riza’), was made in 1836 on Mount Athos, and incorporates its own integral ‘frame’ or border, with a tree of Jesse springing at the bottom and winding its way, in the guise of a Eucharistic vine, around the medallion busts at the sides to the angels, Virgin and risen Christ at the top. The cover reveals only the faces of the Madonna and Child, and has helped to preserve the condition of the painting over the last two hundred years; although it has been much restored. The icon is thus framed twice – once by its precious covering, and again by the carved and gilded wooden shrine in which it is mounted. Whilst the ‘frame’ of the cover is emblematic, and expands upon the meaning of the icon itself, the shrine is purely decorative, presenting the image of Mother and Child like a precious jewel in a golden ornamental setting. 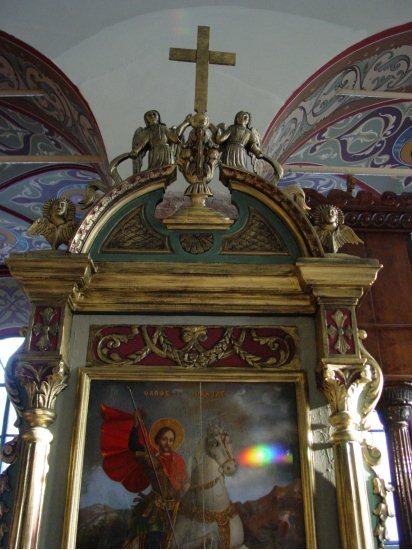 Where altarpieces in Catholic and Protestant churches are usually removed slightly from the presence of the congregation by their setting and their size, the Orthodox shrine brings the holy image it contains close to the individual worshipper, who can pray before it in an intimate relationship, touch it, and kiss it as a sign of veneration. The frame of the shrine and the armour-like covering of the ependesi are not, therefore, intended (as it may appear) to close off the icon, but actually to bring it nearer to those who come to pray. The polychrome shrine, above, in the church of Agioi Anargiroi, is carved in revival Baroque style with NeoClassical medallions and arabesques on the panel beneath the icon and the lower pilaster panels; the icon has also been framed in a conventional NeoClassical pattern. The thorakion, the panel beneath the icon, is decorated with the scene of a martyr undergoing death by stoning. The free-standing columns to each side support – rather than an entablature, as in an altarpiece – two polychrome and gilded angels, and the Baroque pierced cartouche at the crest is topped with the crown of Greece. 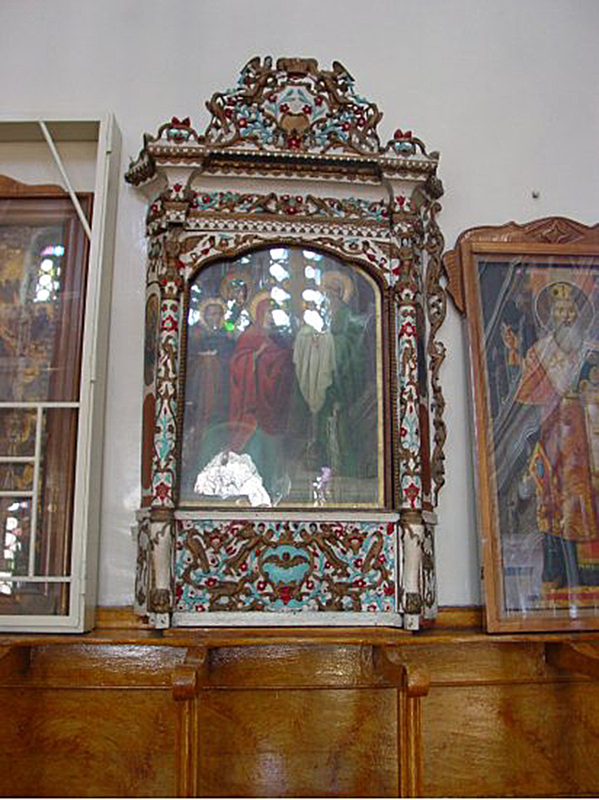 As in this example, many shrines hold icons from older churches which have been destroyed or demolished ; sometimes these might be icons which were originally part of an iconostasis, and have been salvaged from the larger structure. Depending upon their position inside the church, shrines are classified into two general kinds: in the first are wall or pillar shrines, where the rear panel is not visible and therefore is not decorated. This type of shrine usually holds the icon in an upright position, though this is not always true. The second category is the free-standing shrine, where the icon is usually placed in an angled or horizontal position. In the first group of wall and pillar shrines three different types can be identified. 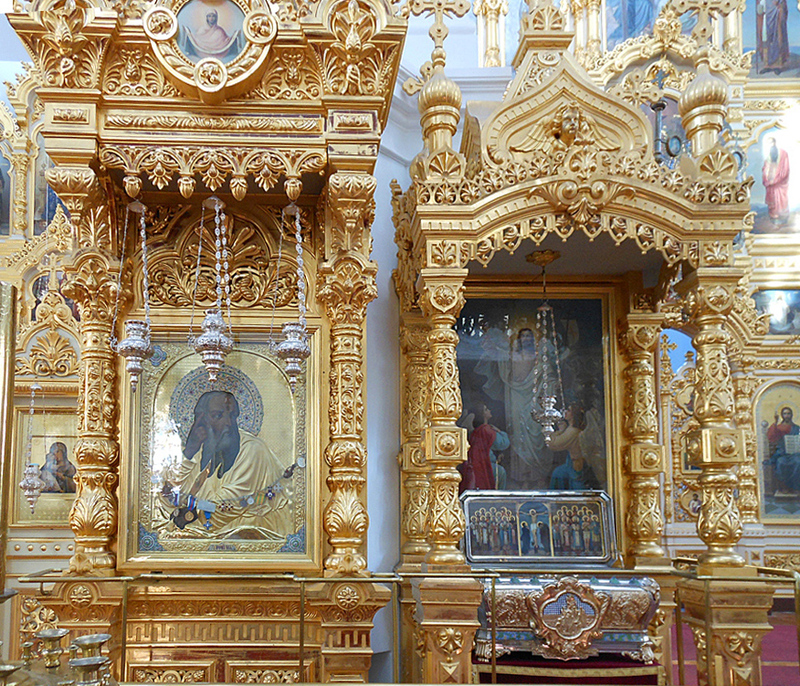 Shrines of the first type (above) seem to echo – as described previously – a single bay of the iconostasis, as if one of the despotic icons, together with its thorakion, columns, and crest, had become detached from the main structure. These shrines tend to have very little depth from front to back; they are frequently decorated in Baroque or NeoClassical style. 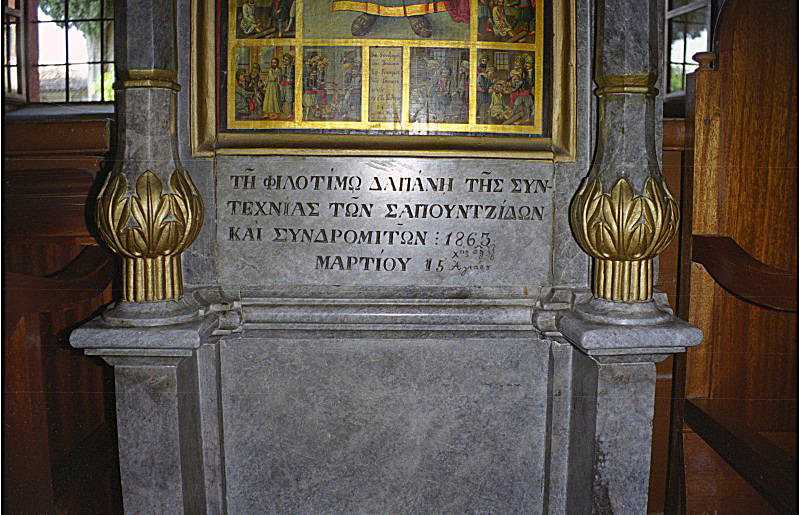 In the example above, the shrine of St Michael the Archangel is probably a reconstruction of older pieces; behind the Despotic throne next to the shrine is the inscription: Ὁ Μέγας Ἀρχιερεύς, 1846 νοεμβρίου α΄ (The Great High Priest, 1846 November a’). The capitals are characteristic of Chios, and the crest of Naxos. The crest was probably added in 1795 when the icon was moved from the left to the right side of the church. 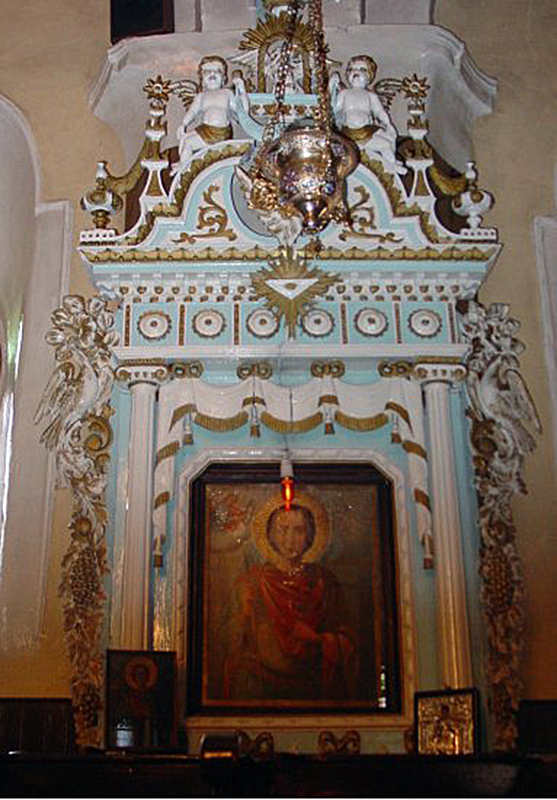 The rather later shrine of St Nikitas, above, dating from the mid-19th century, is another example of this first category of shallow wall shrine with a complex, aedicular form of frame, based on a bay from an iconostasis. 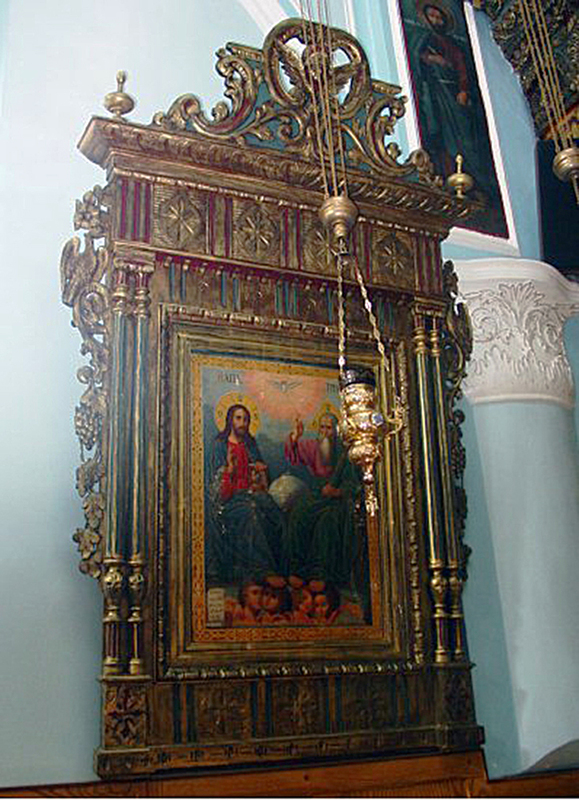 The second type of wall-mounted shrine looks rather like a chair in its structure, as it is built with a large base or desk, allowing for the angled placement of the icon for purposes of veneration. Canting the icon back like this encourages the worshipper to kiss the icon whilst making the sign of the Cross. The impression of a chair is reinforced by the solid back and pillared sides, usually supporting an arched apex. This type is rare; it derives from marble shrines on the island of Tinos. Wall shrines of the third type are shaped almost like a small church, with four columns, an entablature, and a pedimented gable or small dome (above). They may also have a canopy supported by cutaway sides, like a Despotic throne . Shrine by Ioannis Xatzidiakos, dedicated to Zoodohos Pege, 1912, Church of Zoodohos Pege (Mary of the Spring), Mesagros, Lesvos. The early 20th century shrine above, which similarly imitates a small temple in austere classical style, holds an icon of Zoodohos Pege, inscribed ‘Διὰ Συνδρομῆς καὶ ἐξόδων τοῦ κυρ. Χατζῆ Δούκα Μαλιάκα, χεὶρ Ἀντωνίου 1801’ (commissioned by Mr Xatze Douka Maliaka, by the hand of Antoniou, 1801). It exemplifies the respect for icons of whatever age, and the continual recreation of appropriate ways of framing and presenting them as objects of timeless veneration. 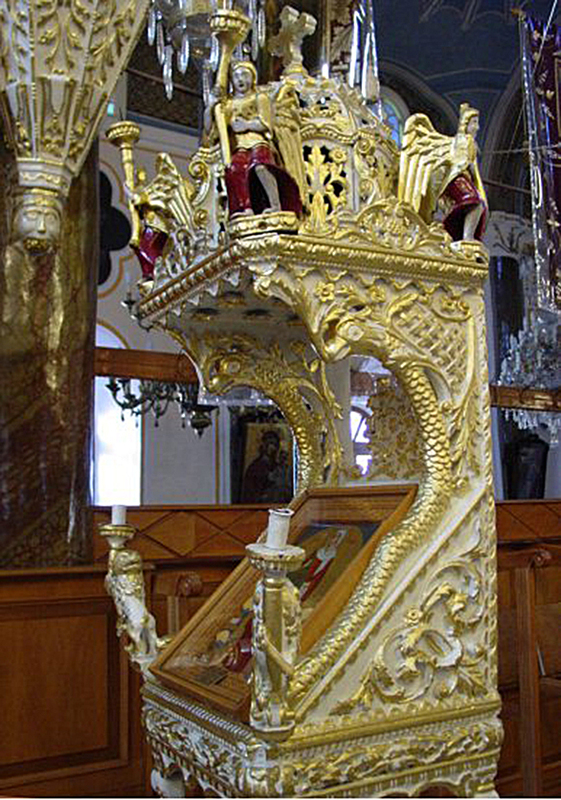 Despotic throne, Church of Hagios Georgios, Volissos, Chios, 1842, carved giltwood with white paint in Baroque style. 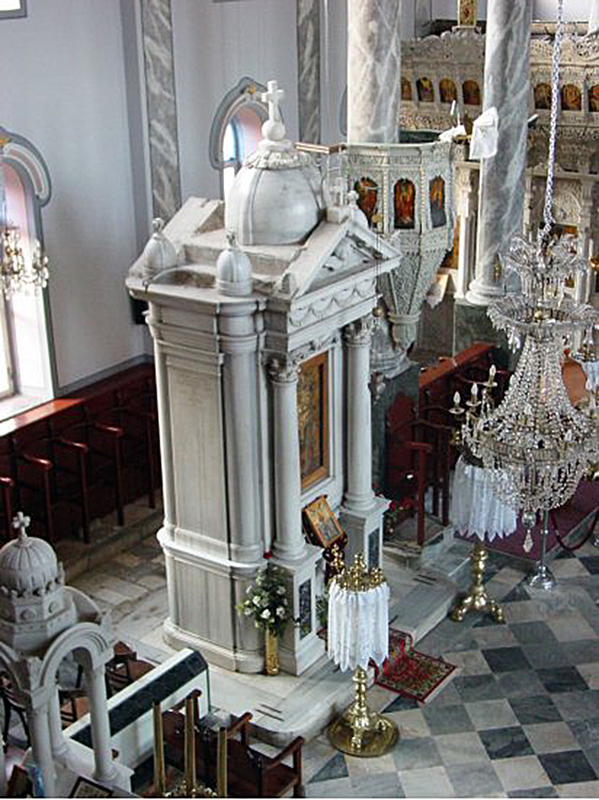 Despotic throne, Church of Hagios Georgios (above); side view. 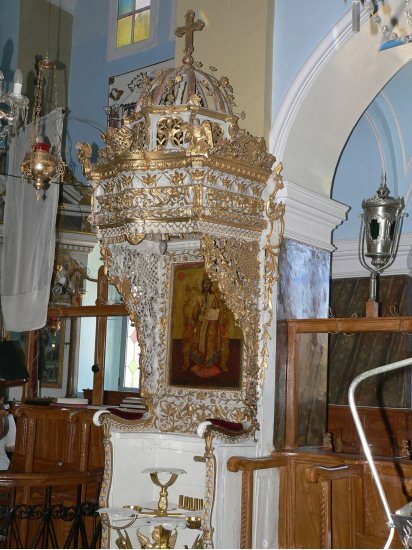 With the type of shrine shaped as a Despotic throne, the icon displayed is always of Christ, since he is the original Despot (Δεσπότης); in most cases it is mounted vertically in this type of shrine. The structure itself is generally 19th century or later, and carved of marble from Tinos. A sub-branch of wall-mounted shrines completes this category; these are framed shrines, either of wood or marble, which have no base. They are very similar to the smaller, domestic type of altarpiece familiar in Western Renaissance art, made to stand upon a chamber altar, prie-dieu or on brackets on a wall. Many of these shrines, especially those of carved wood, are transformed into magnificent compositions with double or triple columns and intricately decorated entablatures, pediments and crests. 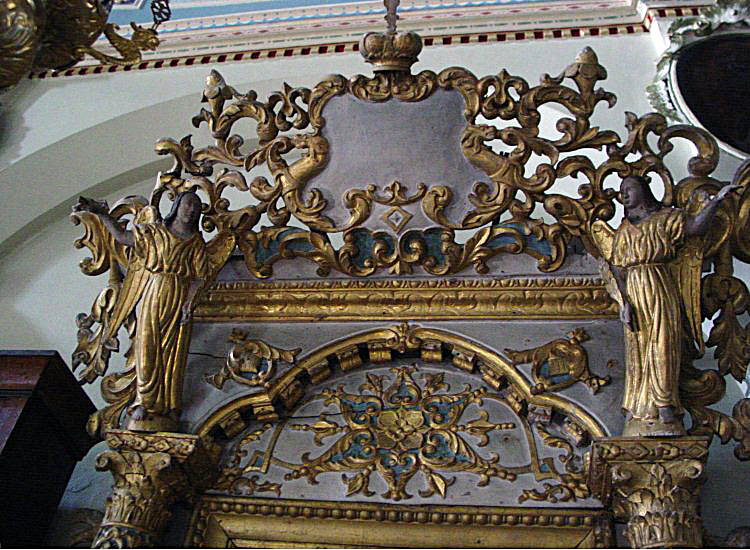 The example (above) of a wall-mounted shrine with no base is carved in Baroque style, and features naturalistic motifs of flowers and birds around the columns. The crest is supported by two prominent angels. It probably dates from the 19th century. 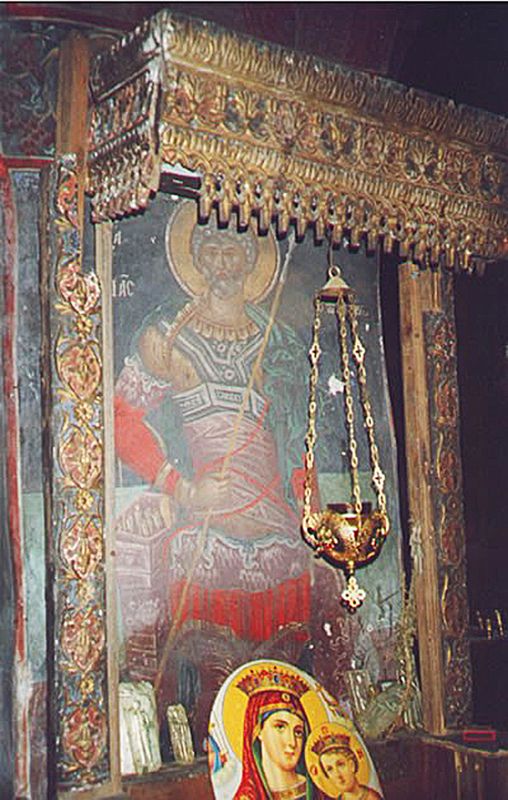 Carved giltwood and polychrome wall-mounted shrine, The presentation in the temple, end of the 19th century, Church of Hagia Triada (the Holy Trinity), Elata, Chios. Another instance of a wall-mounted shrine with no base is that of The presentation in the temple, framed in provincial Baroque style, with, again, a plethora of flowers and birds, carved and picked out in turquoise, gold and red. This shrine possesses a small thorakion at the bottom, in spite of its construction, which holds a representation of the Holy Ghost at the centre. 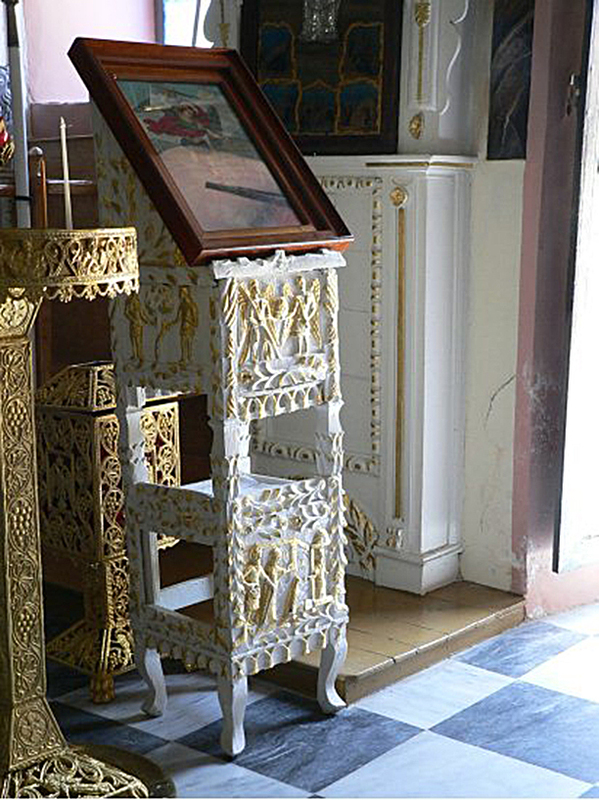 Carved wooden white & parcel-gilt free-standing shrine, Church of Taxiarhis, Anavatos, Chios. There are four distinct kinds of free-standing shrine. The first kind is shaped like a lectern, with a higher back and a sill, which support the icon canted at an angle. These are ideal for the display of icons intended for personal worship and veneration. 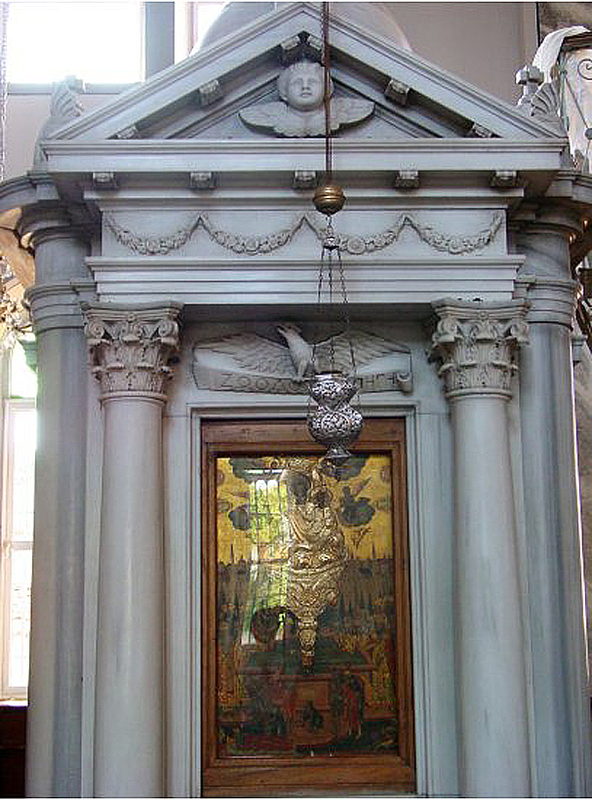 Since the whole structure is free-standing, the exposed back is decorated equally with the front (in this case, above, the front is carved with the Expulsion from Eden; the icon shows The Miracle at Chonae by St Michael the Archangel). The most interesting shrines of this type are those sculpted from marble by Tinian artists. The second type of free-standing shrine is a version of the Despotic throne with a canopy or dome. 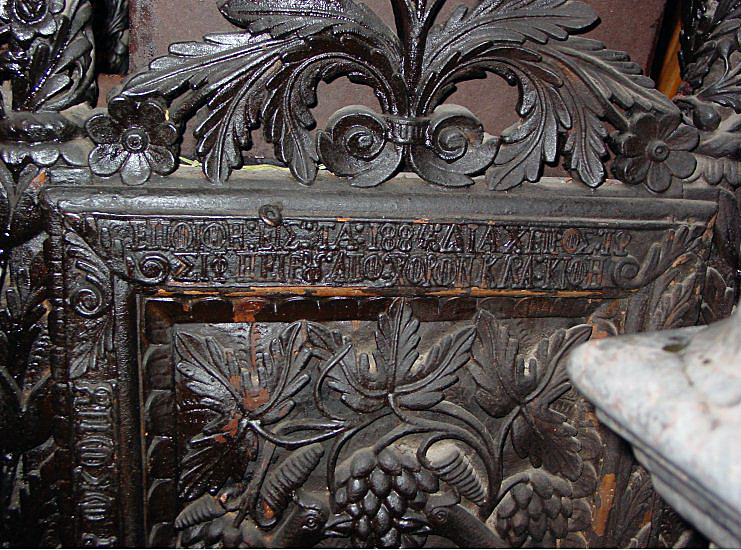 The back in this case is open, or carved with pierced patterns; the icon is placed on a lectern in a slanting position. 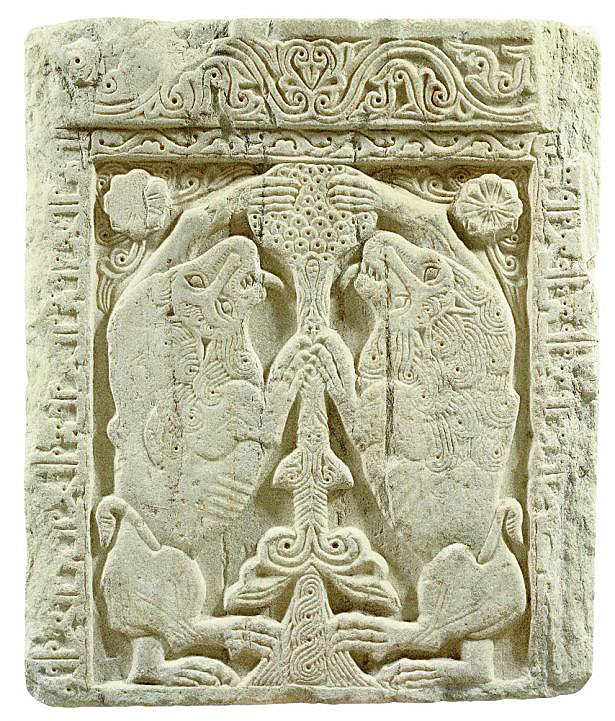 Many examples of this kind of shrine are carved in wood, in Baroque style, but again the more remarkable instances from the Aegean region are marble shrines of Tinian creation. Free-standing carved giltwood & polychrome wooden shrine in Baroque style with dome, end of 19th century, Church of Neos Taxiarhis, Mesta, Chios. 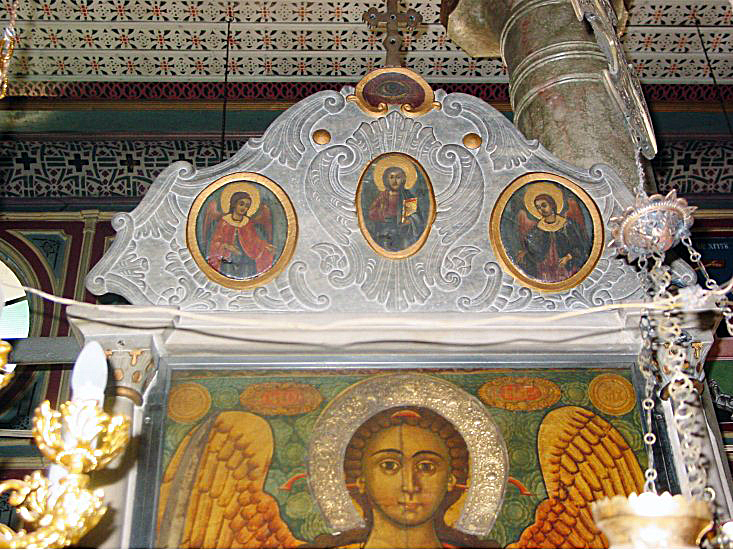 The wooden example, above, is mounted with four angels at the corners of the dome, the front two of which carry candleholders, echoing the two on either side of the icon. This is reminiscent of the angelic lightbearers on the frame Bellini had designed five hundred years earlier for his triptych in the Church of the Frari, Venice. Free-standing carved giltwood & polychrome wooden shrine in Baroque style with dome, end of 19th century, Church of Hieros Naos Zoodohou Peges, Kene, Chios. 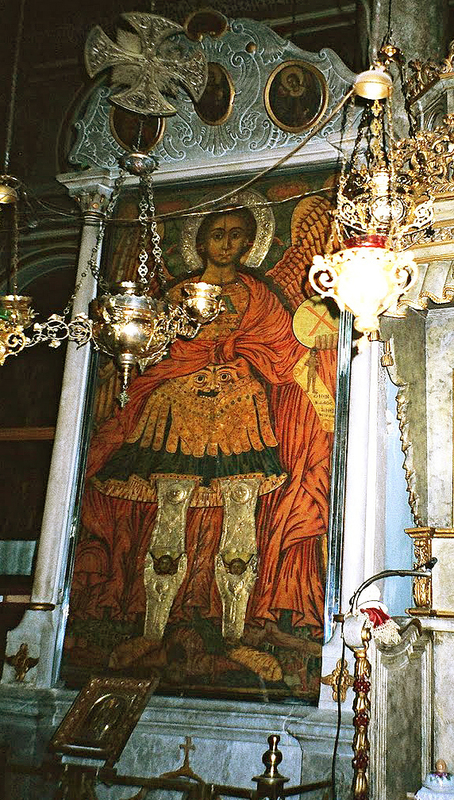 Even more prominent angels are poised around the silver coated icon in its mini-cathedral, placed by the pulpit in the Church of Hieros Naos Zoodohou Peges, Kene, on Chios (above). 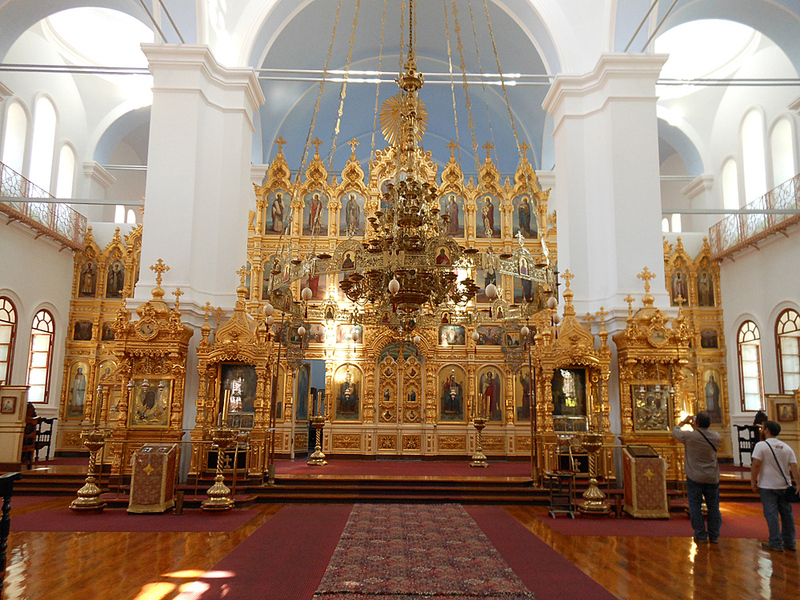 They are a reminder that Orthodox churches, which tend to have fewer and smaller windows than, for instance, French and British churches, need every possible aid to illumination, including a prevalence of white paint and gilding, as well as candles on or around each individual object of reverence. Candleholders were often a necessary, as well as a symbolic and ornamental, part of the design of a shrine. Free-standing carved wooden shrine, 1884, Church of Hagios Athanasios, Mytilene, Lesvos. The third type of freestanding shrine is capped by a domed canopy, standing on a drum supported on four gables, which are themselves supported by four pillars. This is an older design, first carried out in carved wood, and adopted in the early 20th century on the island of Tinos, where it was revived in marble, in classical style. Most marble creations in this category are thus either Tinian projects or copies of them. Examples carved in wood are earlier in date, and are usually Baroque in style; they also appear more like a large piece of ornate furniture and less like an architectural construction, as marble shrines tend to do. 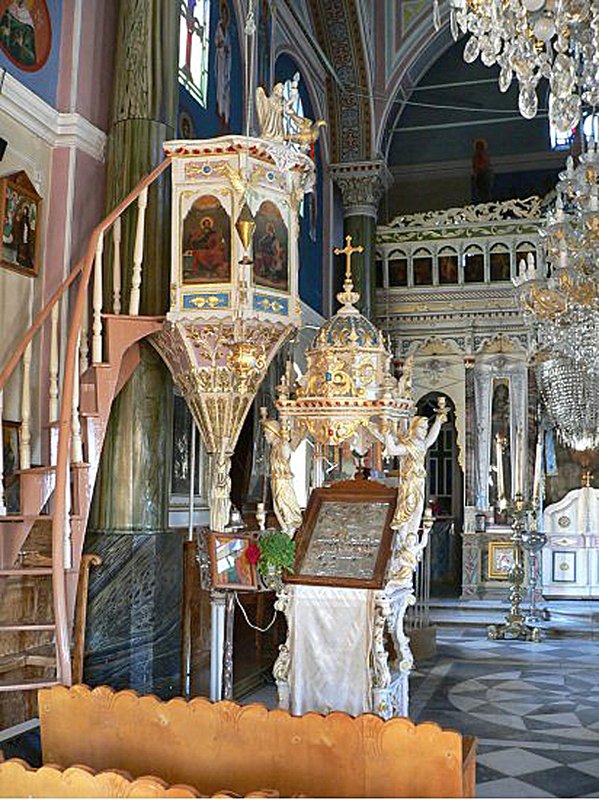 The iconostases and shrines in the Monastery of St Andrew, Mount Athos, are made in the Russian style. The monastery was occupied by seven hundred Russian monks until the 1917 Revolution; between 1918 and 1941 the Orthodox Church suffered persecution and closure on a massive scale, and it was impossible for more monks to travel to Mount Athos. The last surviving monk died in 1971, and the monastery is now run by the Greek Orthodox Church. 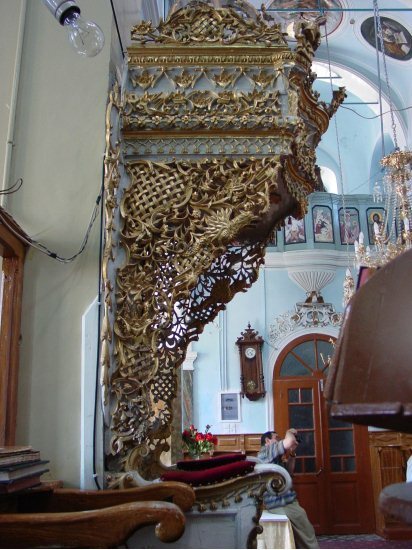 The canopies of the shrines, like the arches and finials of the iconostasis, are very much Russian rather than Greek in derivation, with cusped ogee arches and scalloped pendants. 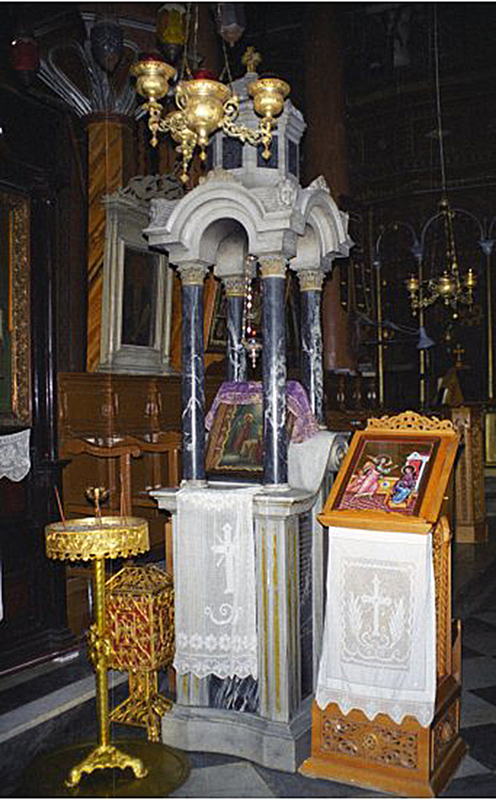 The shrines are of the free-standing lectern form, but the icons they support are generally larger than is customary for this type of shrine in the Greek Church. 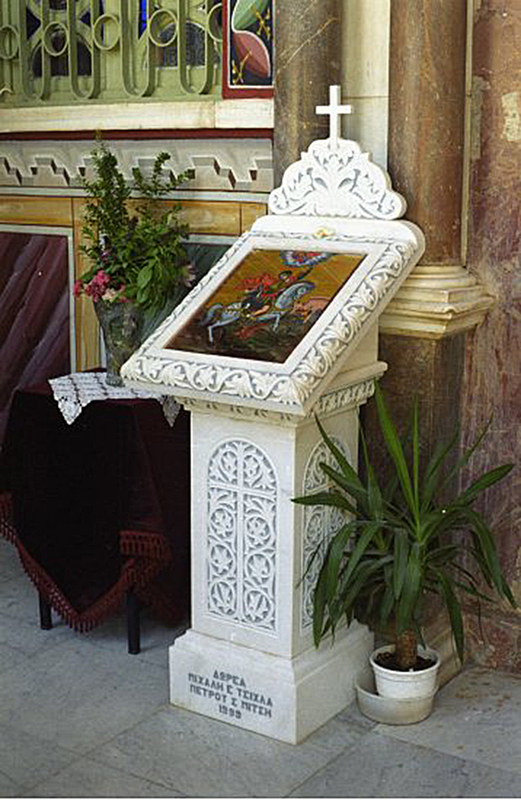 Free-standing pillar shrine, 1999, Church of Hagios Georgios, Vrontados, Chios. The final type of free-standing shrine is constructed like a small table-lectern with a central supporting pillar; it is relatively rare and almost always made of marble. 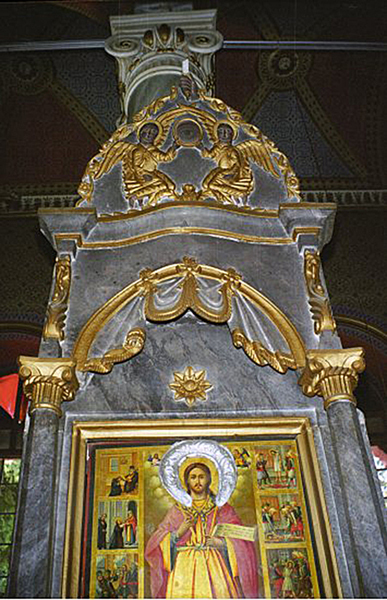 The late 20th century example (above) holds an icon of St George, and is decorated in Byzantine style, with crisp, shallow relief decoration. This revival of Byzantine motifs dates from the 1930s, and follows the Baroque fashion (18th century and first half of the 19th), and a NeoClassical revival (second half of the 19th century, and first quarter of the 20th). The author would like to thank Yannis Karadedos and Methexis Publications, for permission to adapt text & information and to republish images; also Andronis Andronikos, Olga Andronikos, Larisa Gorina and Valeria Sapegina for all their help and support; and Lynn Roberts for editing. Especial thanks are due to the Holy Church of Panayia Alexiotisa for letting me use any image I wished from their amazing blog. See Τσίρου – Μαρκαντωνάτου Βασιλική Φιλόλογος-Θεολόγος-Ἱστορικός Τέχνης ΜΑ, ΠΕΡΙΟΔΙΚΟ ‘Ἐρῶ’ , Δ΄ ΤΕΥΧΟΣ, ΟΚΤ.-ΔΕΚ. 2010 (Tsirou – Markantonatou Royal Scholar – Theologian – art historian MA, Magazine ‘Question’, Oct-Dec.2010). The Basilica comes under the jurisdiction of three churches (Orthodox, Catholic, and Armenian); however, during the 1850s Palestine was part of the Ottoman Empire, and – in answer to an attempt by the French to wrest back control – the Sultan of Turkey issued a 15-page firman (1852), declaring that, by the rules of cohabitation, all icons and the keys to the basilica belonged to the Orthodox Church. 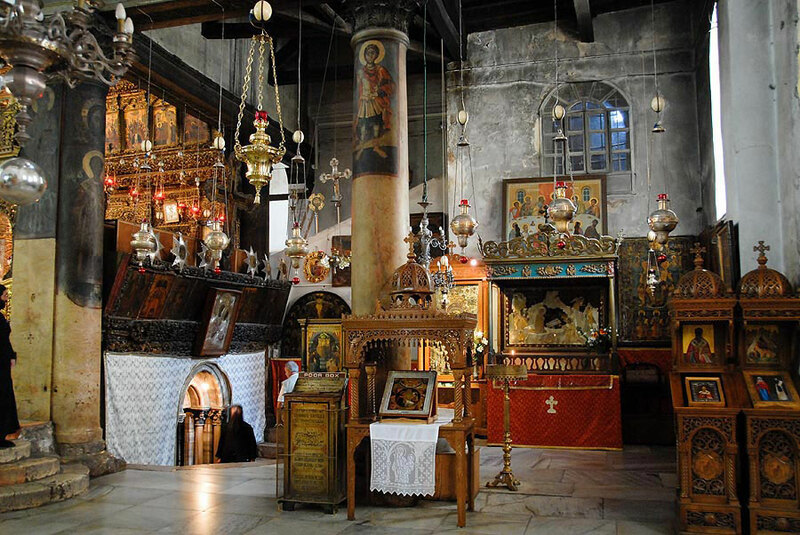 This also meant that woodcarvings dating from the mid-19th century (the iconostases, the shrines, and any frames) are Greek Orthodox in origin (see Nick Bakounakis, Μπακουνάκης Νίκος, To Vima, 22 December 1996). Εμμανουήλ Ιωάν. Φαρσάρη: α) Οι ξυλογλύπτες (νιταδώροι) Μέσα Λασιθίου Οροπεδίου Λασιθίου (αυτοέκδοση, 2001). Ibid. And see Byzantine and Christian Museum, ‘Από το Ανθίβολο στην Εικόνα’ . The Orthodox church celebrates a saint on his or her name day, as does every worshipper who has that name. See ‘Προσκυνηταρια’, Τριαντάφυλλος Σιούλης, 2006, Οδηγός Περιφέρειας Ηπείρου. The Despotic throne stands in front of the iconostasis, and is occupied by the Patriarch when he visits the church. 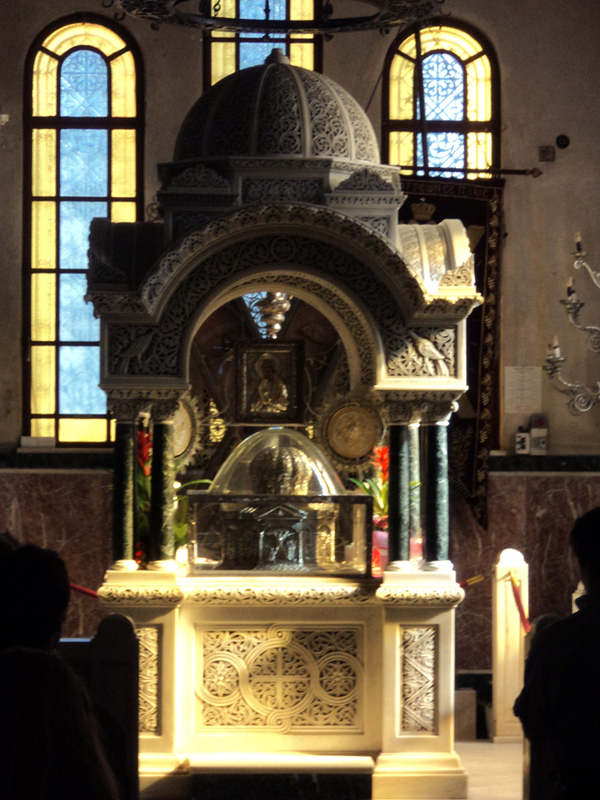 It is made of wood or marble, and echoes the thrones of the Emperor and Patriarch of early Byzantine churches. After the fall of Constantinople, when the title of Emperor ceased, the two thrones became one (Γιουλακη Βουτυρά Καραδερος, 2011, p. 70).